Usually the toe clipper that you use for yourself is not the optimal one to use on your dog. Just like yours have the curvature for the human fingernail, there are clippers that work well for your dog. Ones frequently used when cutting a dog’s nails are the clippers that have a scissor style. These can reach tight spots and are good in case your dog is trying to move around. As mentioned earlier, when a dog’s nails are too long or too short, bad things can happen. Ideally, your dog’s nails should not touch the ground. Generally you should think about cutting the dog’s nails each week. Now that you know what to use and when to use them, you are ready to cut the nails. 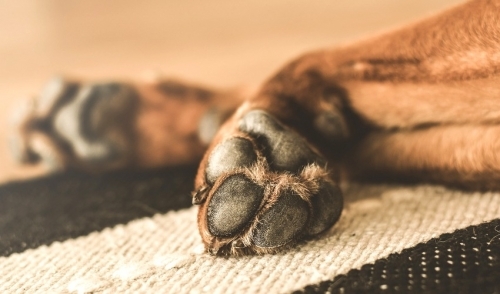 To keep your dog comfortable, you might want to put his paw up on your leg so it’s at a good angle for you and makes the process a little easier. You can also entice you dog with the “good” food items like cheese or hot dog slices. Where to cut is the tricky part. Dogs have a blood vessel right in the middle of each nail called the quick. You can see where it starts and ends if your dog has white toenails. If he has black toenails, you’re going to have to be more precautious when you cut. Take small pieces of the nail off at a time and make sure that the dog associates the clipping with the food. That will make him a little bit less jumpy. If you do happen to accidentally cut the quick, take some clotisol and dab it on the end of the nail to stop the bleeding.